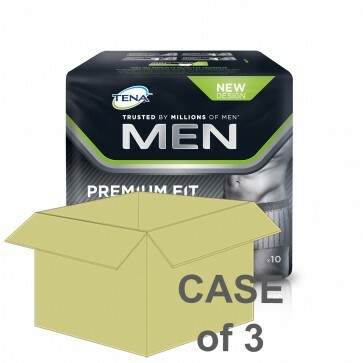 TENA Men Premium Fit Level 4 are comfortable incontinence pants designed for men with moderate to heavy incontinence. The pants are specially engineered to fit a male's body, ensuring maximum comfort and security during use. TENA Men Protective Underwear stretches to provide a close fit and excellent comfort, ensuring excellent discretion and safety. The soft elastic sides in the product create a snug and secure fit and a cup shape making the protector comfortable to wear. The pants have been dermatologically tested in order to ensure the material is kind and gentle to the skin. An ultra absorbent core made of polymers is also included in the pants to instantly lock in liquid and keep you free from leaks. TENA pants feature odour control technology to keep you feeling fresh throughout the day, ensuring you are free from any unwanted odours. TENA Men Premium Fit features a brand new sizing guide to reflect male trouser sizes. The pants are designed to look and feel like everyday underwear, so you can relax whilst wearing a product that is comfortable and discreet.